The Laws of Cooking . . . and How to Break Them encourages improvisation and play, while explaining Justin Warner's unique ideas about "flavor theory"-like color theory, but for your tongue. By introducing eleven laws based on familiar foods (e.g., "The Law of Peanut Butter and Jelly"; "The Law of Coffee, Cream, and Sugar"), the book will teach you why certain flavors combine brilliantly, and then show how these combinations work in 110 more complex and inventive recipes (Tomato Soup with "Grilled Cheese" Ravioli; Scallops with Black Sesame and Cherry). At the end of every recipe, Justin "breaks the law" by adding a seemingly discordant flavor that takes the combination to a new level. 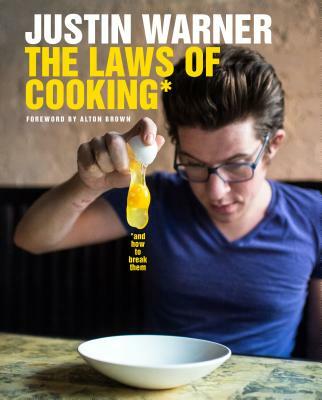 JUSTIN WARNER is the winner of the eighth season of Food Network Star and is the chef/co-owner of Michelin-rated Do or Dine restaurant in Bed-Stuy, New York. His first Food Network appearance was on 24 Hour Restaurant Battle in 2010, which he also won. He continues to be a frequent guest on Food Network and hosts Foodie Call, a new Food Network web series. Warner was a waiter at Danny Meyer's acclaimed restaurant The Modern prior to starting his own career as a chef.